When choosing infant photography in PDX you have a lot of choices. There are a lot of questions to ask a newborn photographer about safety and training. Take a close look at the photographers work. How is the lighting? Is the photographer using side lighting or braod lighting. Are they shooting up the babies nose? How consistent is the posing? Are there curled hands and akward poses? London came to the studio at just 10 dayw new. She is such a pretty baby! London's mom brought this blew bow with her to the session. It was a gift at her baby shower. We had a scarf wrap that was perfectly matched in color. London's parents are repeat clients with newborn photos! 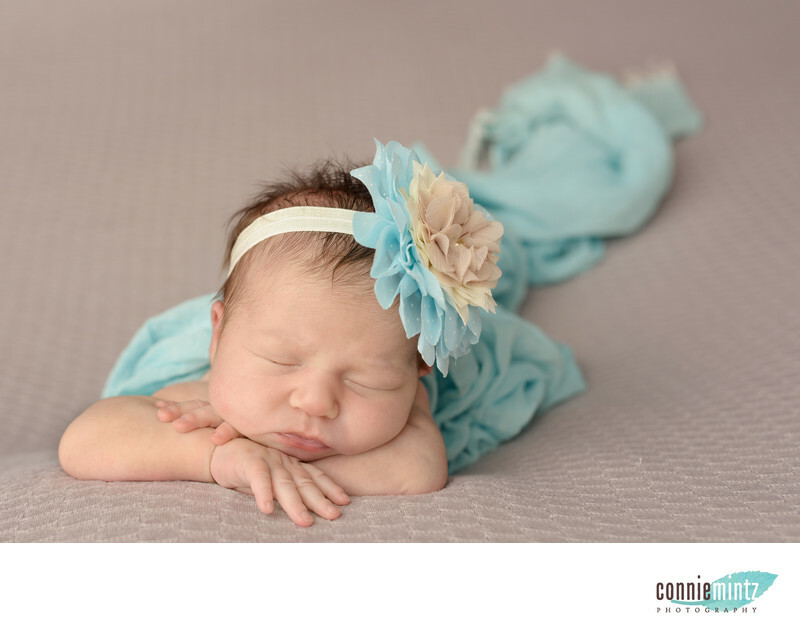 For this prop, we used a grey backdrop and the beanbag.Keywords: baby (45), blue (9), headband (3), infant (15), Newborns (24), Photographer (12), photographs (6), portland oregon (6), vancouver washington (6). 1/200; f/3.2; ISO 64; 35.0 mm.